The DNI is the latest-generation system for refrigerant leak detection. The DNI measures the refrigerant level in the liquid receiver as well as other parameters such as temperatures and pressure. Taking measurements every two to three seconds, the DNI provides full leak detection, continuously. 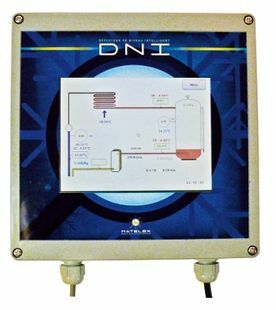 Installing the DNI equipment reduces the frequency of leak detection in systems according to EU Regulation no. 517/2014 Art.4. The energy module of the DNI calculates the energy consumption of the installation and the actual COP. The floating HP module can save energy where this is not already controlled with a similar device. Sentinelle, the online interface for DNI management, is a complete monitoring and traceability tool for refrigeration installations, although it can be run as a standalone system if required. When used on a selection of installations in superstores and hypermarkets, the DNI showed a 79% saving in refrigerant compared with traditional leak detection (Ademe report of February 2011), with a return on investment of less than a year. For product information or a no obligation chat about how the DNI can help your business, please call 0117 980 2520 to speak with one of our friendly sales team.